Pioneers in the industry, we offer survey theodolite and nikon survey theodolite from India. 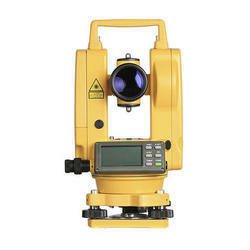 We are engaged in offering a huge array of Survey Theodolite to our customers. We offer these at market leading rates. Designed for general construction and survey applications, Nikon NE-100 Series electronic digital theodolites give you accurate measurements in an affordable, easy-to-use platform. Each of the four models has an ergonomic keypad with one-touch keys for all functions, and a large backlit LCD display helps you work productively in the field. You can instantly convert vertical angles to percent of grade, reset the horizontal angle to zero and lock the horizontal angle displayed on the LCD, while you reposition or repeat a measurement. The NE-101 offers 7" angle accuracy.